The cause is another continental divide. We are here at the eastern rim of the Arabian Tectonic Plate which is crushed against Europe by the African Plate. I have blogged about this before, explaining the Wegener theory (not a theory since a long time anymore) that the continents are a sort of parts of a large dinner plate (broken in to the continent pieces a long time ago) that mainly drift westwards but not always. Far down at the sea bottom the two plates meet and slowly but steadily the Somalian Plate pushes the African Plate to the North East. So the distance from South America is getting larger by a few centimeters every year. The Arabian plate has nowhere to go but follow and here the mountains are getting higher. 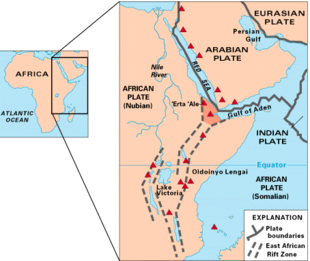 (Wait a million years and you can see the difference) This is caused by the west moving Somalian plate which is pushing under the African plate and that gives these very deep canyons under water. And we are sailing right over the top at the moment. We are now in real pirate waters and we have extra guards on board for our security. They act as extra lookouts and the make patrols around the ship and can jump into action if a boat would come too close. The chance is really small as it is nearly impossible to get on board a fast sailing cruise ship with a high freeboard. (Freeboard means the height of the side of the ship without permanent openings) If a small skiff would come close then we have a whole array of options available to make this boat change its mind very quickly. I hope that you do not mind that I do not explain what those options are; let’s say our extra guards brought a whole lot of interesting gadgets on board which would make the life of a would be pirate extremely uncomfortable. And those gadgets are on top of what our ships normally carry themselves as standard equipment. This is a photo of the standard advisory chart out in the public domain for navigators. As usual it is based on past experience but its main purpose is to alert the captain of a ship to be extra cautious. 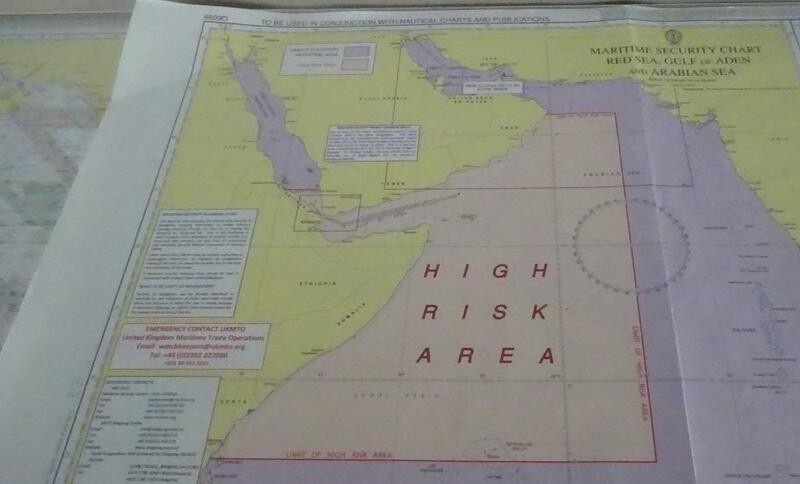 The pink area stretches just into the Red Sea which means that the day after Salalah we are still in the area. Thus the today the guests could and had a relaxing day. Is life on board much different than from a Holland America Line ship? Not that much, let’s say that the crowds are less which is comparable to our Prinsendam and that everything is included, except the very premium stuff. Cruise staff get togethers and games, build your own boat competition, bridge lessons, Golf putting, Lectures, etc. etc. it is all there. The only thing I have not seen yet is bingo. 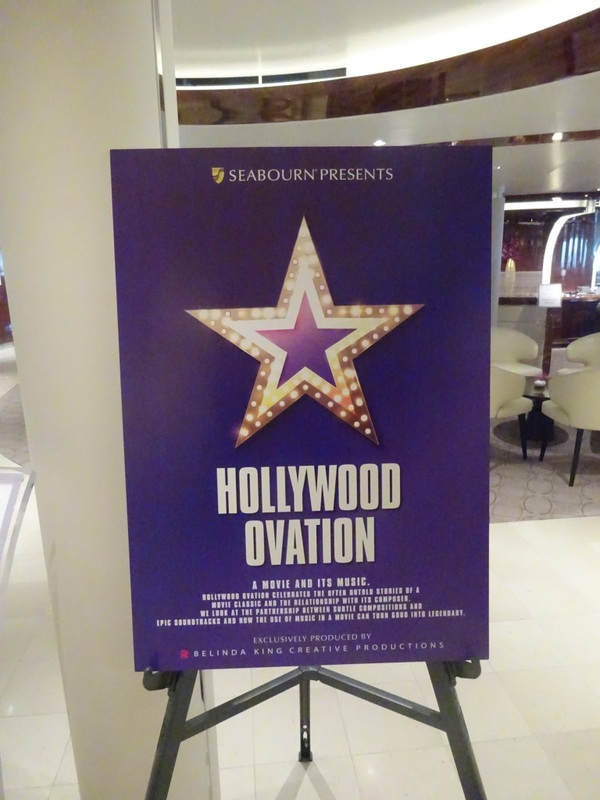 Poster advertising the show. this stands in the Plaza which is a combined venue for Front Office, shore excursion, library and Coffee & ice cream bar. Where there is a difference is with the food. Due to the higher per diem the guests pay there are some differences in what is being offered and also how it is being offered as there are more waiters on call. There is not much self-service and while it is wonderful to be waited upon hand and foot it makes it very hard to keep a diet going. In the evening every meal is served and choice comes via the menu and then……………. there goes the focus on not expanding the waist line. For my current work here on board I am sitting a lot (to review and elaborate on training courses) and thus I have a challenge with the calories. Because the number of guests on board is smaller, the community atmosphere is very quickly established. Last night there was a Block Party (everybody out of the cabin and meet your neighbors in the corridor; while Captain and Hotel Director run through all the ships corridors to say hello) and with a glass of champagne (or two) some guests lingered for a long long time. Last night we had a revue show which was very similar to Holland America and that makes sense as the two companies rotate their talent. You will see the smaller Seabourn Groups also on the HAL ships now the Music Walk is in full swing. But the HAL revue shows are also on the Seabourn ships, although the dance company is smaller as the main stage is smaller. Tonight there is a Piano player and a West End Vocalist called Lorraine Brown. I have not heard from her but her resume on the internet is quite impressive. Tomorrow we are in Salalah, which is also in Oman and it has the same weather. Warm and Sunny.